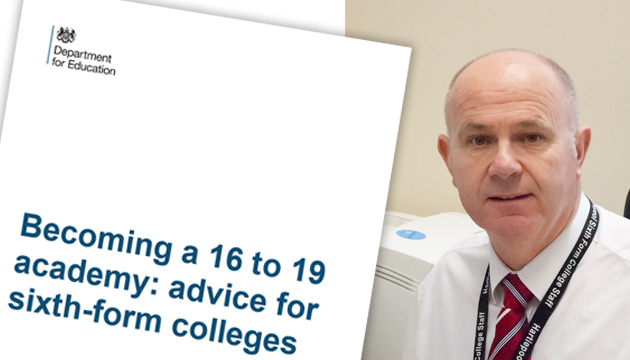 A principal has spoken out over the “significant pressure” being placed on dozens of sixth-form colleges (SFCs) that have been given just a few weeks to complete the complex application process for academy status. The Department for Education (DfE) finally published guidance on how SFCs can go about converting to academies on February 19. And although providers involved with phase one of the post-16 area reviews were given draft guidance at the end of last month, it still left the 33 SFCs involved with little time to digest the information and potentially lodge applications before the process closes for many in March. FE Week contacted all of them over the past week and of the six that provided detailed responses, in which they all confirmed they were actively considering academisation, the principal of Hartlepool SFC Alex Fau-Goodwin (pictured) felt strongly enough to go on the record. He said the timescale was far too tight for his college, which is part of the Tees Valley area review, and for many others. “As a college in wave one, this places significant pressure on effective strategic decision making in order to meet the timescales of the area review,” said Mr Fau-Goodwin. “When you consider the [academy status] application process, colleges are required to complete a detailed return to include details on collaboration with named schools, strategic financial planning and forecasting, governance structures, and information about the estate. He added: “The ink is still drying on the guidance document, yet colleges in wave one are expected to submit these proposals in a very short timescale, this is going to be difficult. SFCs can only convert to become an academy as part of the area review process, according to the guidance DfE guidance document. A total of 33 SFCs and 50 general FE colleges across seven areas are involved in the first wave of area reviews, which began between September and November. FE Week understands that a number of these areas will be publishing their reports, including final recommendations, in March. This leaves some SFCs with less than a month to reach a decision — a timescale that another principal who asked to remain anonymous described as not long enough to “consider fully this criteria and to make an informed decision about conversion, let alone complete a 12 page application”. James Kewin, deputy chief executive of the Sixth Form Colleges’ Association, said they had been pressing the DfE on the timescales for academisation. “We continue to make the case for SFCs in waves one and two [of area reviews] to have a greater degree of flexibility in developing proposals for academy status. “Some SFCs in wave one have been given a matter of weeks to provide information (identifying potential partner schools for example) that colleges in wave five will have almost a year to prepare,” he said. The DfE guidance stated that the key assessment criteria for conversion is the development of “stronger partnership and collaboration between the college and schools with which they will work”. A spokesperson for the DfE said it had given SFCs draft guidance ahead of publishing the full guidance, which FE Week understands was sent to wave one sixth form colleges on January 25. This, the DfE said, was “to enable them to begin preparing applications, and we have extended timeframes for all wave one reviews to allow colleges time to consider the guidance and submit their application”. It is unfair and short sighted of the Department for Education to force sixth form colleges in the first round of area reviews to prepare and apply for academy status in just over four weeks, when others in future rounds are likely to get at least a year. 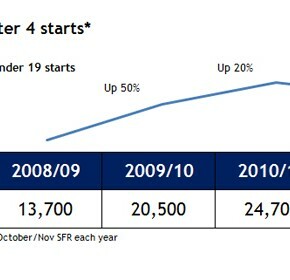 This is all a consequence of Skills Minister Nick Boles’ decision to force through the one time only area reviews under unreasonably tight deadlines. It is hard to understand why decisions over academisation are being tied to area reviews anyway. The colleges that don’t need immediate rescuing from financial problems should be allowed to take their time to make reasoned decisions over whether they want to make the switch in the interests of their learners and future. It’s also one thing to complain off-the-record about the rushed process, but another entirely to have the guts and conviction to break ranks and speak publicly. So full-credit to Alex Fau-Goodwin for having the courage of his convictions and expressing his views so openly and well.